A rich, natural addition to any meal. 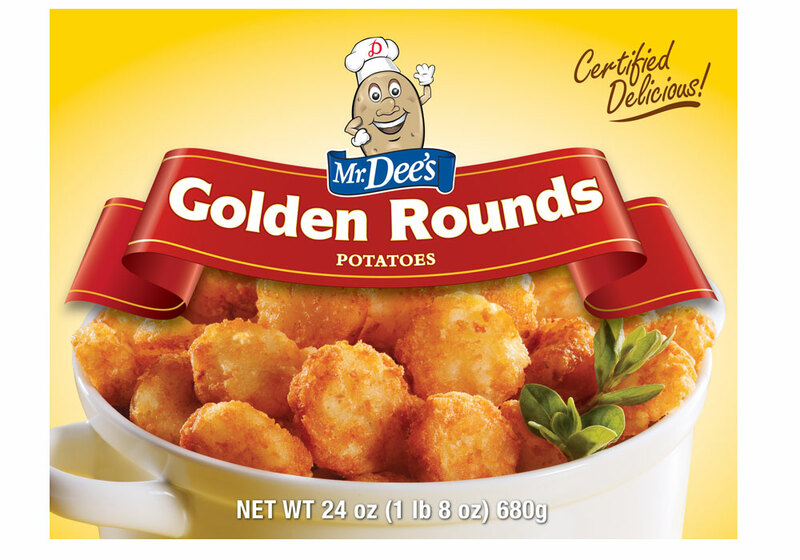 Mr. Dee's Golden Rounds Potatoes are made from 100% Grade A premium potatoes. POTATOES, PARTIALLY HYDROGENATED VEGETABLE OIL (SOYBEAN AND/OR COTTONSEED), AND/OR VEGETABLE OIL (CANOLA, SOYBEAN, AND/OR SUNFLOWER), DEHYDRATED POTATO FLAKES (POTATOES, MONO AND DIGLYCERIDES, DISODIUM DIHYDROGEN PYROPHOSPHATE, CITRIC ACID, SALT, CORN FLOUR, ENRICHED WHEAT FLOUR (WHEAT FLOUR, NIACIN, IRON, THIAMINE MONONITRATE, RIBOFLAVIN, FOLIC ACID), NATURAL FLOAVORING, DISODIUM DIHYDROGEN PYROPHOSPHATE (TO MAINTAIN NATURAL COLOR), DEXTROSE.